Nowadays dentistry has new resources for prosthetic resolution of patients with extensive loss of their dental pieces. New technologies allow protocols to build prostheses where before, they would have no support solution. Out of aesthetic recovery, essential for the patient IT IS NECESSARY to have an initial point of mandibular rest position, as these complex cases make rehabilitation more challenging. Male patient 54 years of age arrived to the clinic for consultation referring pain and sensation of plugged ear, especially on the left side. Also refers pain on top of the head and pain in the left shoulder. Refers an uncomfortable sensation in the left eye, in his words says that “the eye is sensitive”. The image of the patient’s habitual occlusion shows a Class III or mandibular prognathism. The patient reports the prognathism condition even before the dental loss. When we study occlusion most of the time we do not consider if the inter-occlusal space is healthy or pathologic. Patient’s superior and inferior oclusal view. What most encourages the patient to seek treatment was the sensation of blocked ear and his desire to resolve the issue. The patient also relates noises when chewing and fatigue of the masticatory muscles. The patient also reported a numbness sensation near the left ear. The patient had been medicated by another professional with muscle relaxant, but he did not feel any symptoms change. Patient’s initial panoramic radiograph before neurophysiological treatment. The patient has this protocol for more than 18 years. The patient reported a periimplantitis history, and had no image prior to implant placement. Patient’s TMJ right and left laminography, closed and open mouth before neurophysiological treatment. 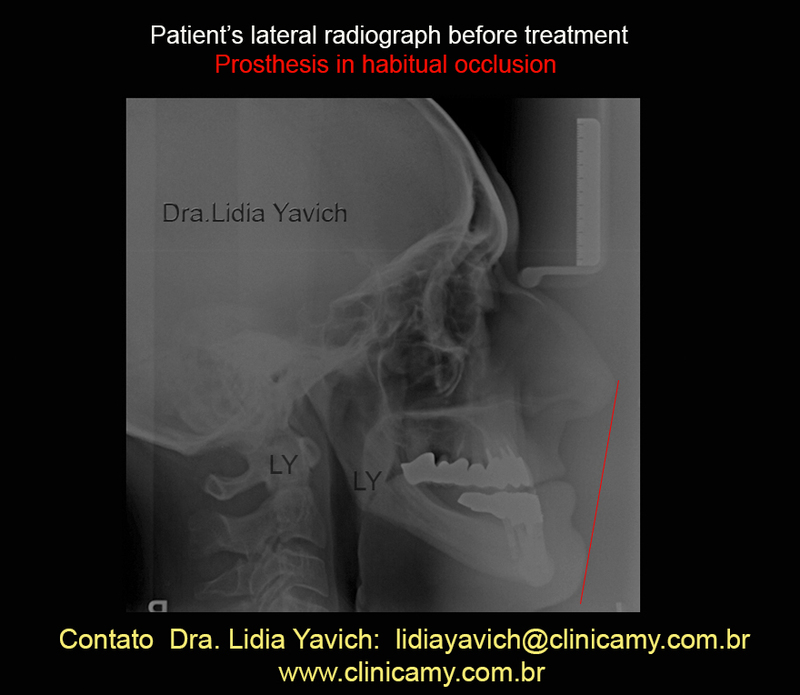 Patient’s lateral radiograph in habitual occlusion before treatment. Marked prognathic profile. Marking the aesthetic plane of Ricketts in the lateral radiograph with the profile of the patient. Patient’s frontal radiograph before treatment. Patient’s dynamic electromyography record in habitual occlusion before treatment. In this dynamic record we registered the anterior right and left temporal muscles, the right and left masseter muscles, the right and left digastric muscles and the right and left upper trapezius muscles. The right masseter muscle ALMOST CAN NOT RECRUIT MOTOR UNITS during maximum sustained intercuspation, it can only generate 21 microvolts in the selected band. Important asymmetry between the two masseter muscles, right and left. Patient’s initial kinesiographic record: we can see a good speed when the mouth opens and a reduction of speed when the mouth closes. There is no coincidence between the opening and closing trajectories in the sagittal view. The opening movement has a propulsive closing and a lateralization in the frontal plane to the right of 8.2 mm. The patient’s masticatory cycles are registered with a jaw tracker. In the record of the masticatory cycles we used almonds to register chewing activity. This post will not make a detailed analysis of this record. But it is important to note that: on the left side of the graph, even if the patient is chewing almonds on the left, THE GRAPHIC APPEARS ON THE RIGHT SIDE. This is due to mandibular torque that the patient needs to perform to chew. MRI: left and right TMJ closed mouth. I chose this slice to show important asymmetry between the right and left side. The left side shows a posterior dislocation of the articular disc. There is NO ARTICULAR DISC on the right side, is IMPORTANT TO MARK THIS, since in several posts I emphasized the importance of recapturing the disks when possible, (IN THIS CASE I CAN NOT RECAPTURE A STRUCTURE THAT DOES NOT EXIST). In this particular case the request of resonance is part of the protocol to obtain fundamental information in the formulation of diagnosis. Different slice and parameters do not show bone edema or other information requiring different interventions within the treatment. The goal in this particularly case will be the three-dimensional repositioning of the jaw, TO RECOVER the neurophysiological function, which should be widely understood, so that the muscles, temporomandibular joints and teeth and prostheses could work in balance. To determine the neurophysiological three-dimensional position of the jaw, even in cases of extensive rehabilitations we have to consider the physiological position of the mandibular rest. The masticatory muscles of the patient were deprogrammed electronically and a resting neurophysiological position was recorded. The patient has a PATHOLOGICAL FREE WAY SPACE OF 7.2 mm. Maintaining the physiological 2 mm we still have more than five mm discrepancy, to be recovered tridimensionally. The jaw also presents a retro position of almost two mm and a deflection at closing of 0.5 to the left side. 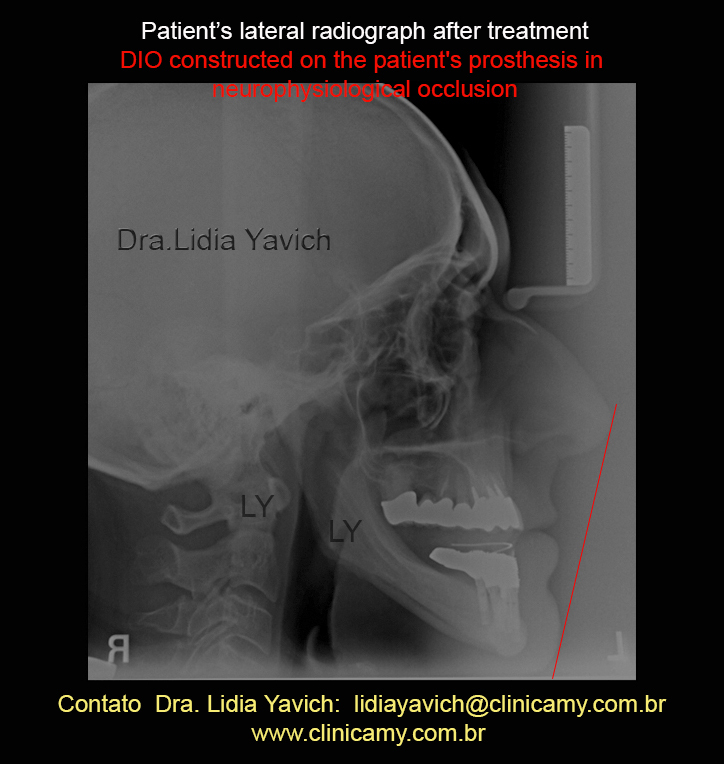 With this data and ALWAYS WITH THE IMAGES INFORMATION, we constructed a DIO (intraoral device) to keep the three-dimensionally recorded position. This device must be tested electromyographically to objectively measure the patient. Patient’s lateral radiograph with the DIO in neurophysiological position. Marking the aesthetic plane of Ricketts in the lateral radiograph with the DIO in neurophysiological position. The DIO is an orthopedic device, recorded and controlled electromyographically. The DIO (intraoral device) is used to support, align and ameliorate deformities in order to improve the functions of the jaw, temporomandibular joints and the muscles. Patient SEMG record with the DIO (intraoral device) in neurophysiological position built above the patient’s prosthesis. We can note the improvement of the right masseter muscle activity. Before the treatment the right masseter muscle could not recruit motor units. Comparison of the SEMG records: before the treatment in habitual occlusion and with the DIO (intraoral device) in neurophysiological position built above the patient’s denture. That’s why the DIO should be adapted, changed, and recalibrated to follow dimensional changes that will happen when muscles are aligned. Patient’s kinesiographic record after neurophysiological treatment. Significant improvement in the opening and closing trajectories. The closure no longer has a propulsive trajectory. The lateralization which was 8.2 mm was reduced to 2 mm. 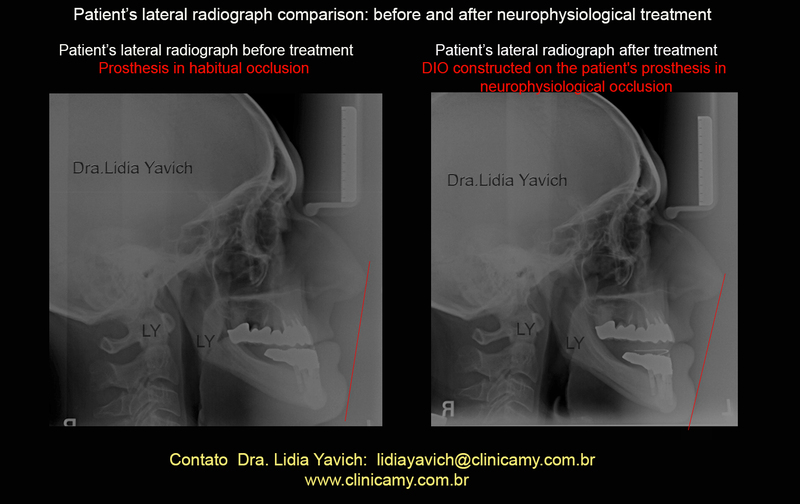 Patient’s kinesiographic records comparison: before treatment in the habitual occlusion and with the DIO (intraoral device) in neurophysiological position constructed above the patient’s prosthesis. Patient’s masticatory cycles after the neurophysiological treatment. In this graph the left side chewing appears on the left side as it corresponds. In the previous graph before treatment in habitual occlusion, the left side chewing graphic appeared on the right side due to mandibular torque. Comparative chewing cycles of the patient: before treatment and after neurophysiological treatment. Patient’s TMJ right and left lamiography, closed and open mouth in neurophysiological occlusion after treatment. Patient’s TMJ right and left lamiography, closed and open mouth comparison: in habitual occlusion before treatment and with the DIO (intraoral device) in neurophysiological position. Patient’s panoramic radiograph after the neurophysiological treatment. Patient’s panoramic radiograph comparison: before treatment and after the neurophysiological treatment. Patient’s frontal comparative images: before and after neurophysiological treatment. Patient’s lateral comparative images: before and after neurophysiological treatment. And here, the words of Confucius: A picture is worth a thousand words. I lived for a long time with discomfort that sometimes manifested itself by a feeling of numbness and sometimes by headaches. I could not identify the cause; although I repeatedly searched for expert help. 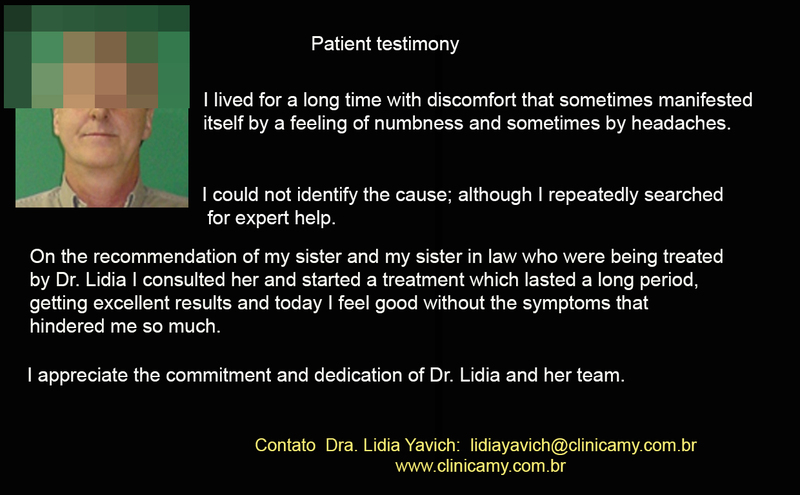 On the recommendation of my sister and my sister in law who were being treated by Dr. Lidia I consulted her and started a treatment which lasted a long period, getting excellent results and today I feel good without the symptoms that hindered me so much. I appreciate the commitment and dedication of Dr. Lidia and her team. This entry was posted in Sem categoria and tagged DIO, Disc dislocation, ear pain, electronic deprogramming, free way space, Head ache, head of the mandible asymetries, joint decompression, Magnetic Resonance Image, mandibular rest position, MRI, Neurophysiological bite registration, neurophysiological occlusion, surface electromyography, TEMPOROMANDIBULAR DYSFUNCTION, TMJ dysfunction, TMJ pathologies, TMJ/TMD by lidiayavich. Bookmark the permalink.